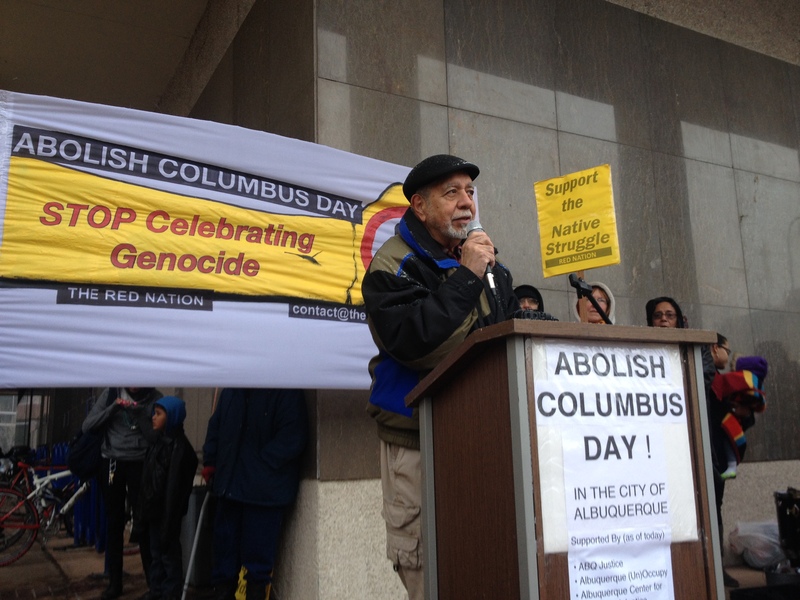 This past Friday a new group of activists, The Red Nation, and an estimated 80 community members endured snow flurries and cold temperatures for a press conference in front of Albuquerque’s City Hall to demand the city abolish Columbus Day. New Mexico is home to a large population of Indigenous people with longstanding history of resistance against an oppressive government. The living conditions and national rights of Native people are still under unrelenting attack over 500 years later since Columbus first stepped foot on Indigenous land. The press conference was held symbolically on the 42nd anniversary of Wounded Knee Liberation Day. On February 27, 1973 the American Indian Movement occupied the Wounded Knee Massacre site in Pine Ridge, South Dakota, which lasted for 71 days. It was initiated by AIM to spread awareness of historical and ongoing injustices to Indigenous people. The Red Nation is a newly-formed coalition in Albuquerque composed of Native activists and allies to intervene in the struggle for Indigenous liberation against colonialism. The coalition formed as a response to the marginalization of Indigenous people in the mainstream social justice movement. The Red Nation provides a voice and a space to build a widespread movement against a racist, sexist system that profits from the exploitation of Native life and land all across the globe. Nick Estes (Lakota), an organizer with The Red Nation, spoke about the history of genocide perpetrated against the Lakota at Wounded Knee in 1890 and ongoing police and community violence against Native poor and homeless in Albuquerque.”Symbolically, that’s what Columbus Day represents, ongoing violence and genocide against Native people on Native land,” he said. “If South Dakota, a right-wing and racist state, can abolish Columbus Day, why can’t New Mexico?” asked Sam Gardipe (Pawnee/Sac and Fox), from The Red Nation and the Party for Socialism and Liberation. “The Red Nation stands with all Indigenous people and their accomplices in the defense of land and livelihood against this violence and, with you, reclaims Albuquerque as an Indigenous space,” she said. The rally ended with a round dance in celebration of Wounded Knee Liberation Day and the continued commitment of Indigenous peoples and their allies towards liberation across the Western Hemisphere. The Red Nation plans to move forward with a coalition of community, student, and faith groups to work with the Albuquerque City Council to abolish Columbus Day and replace it with a day that honors Indigenous peoples and their centuries of resistance and existence. The group hopes to move this initiative to the state level.